That dark walnut stain may have been a good idea 10 years ago, but styles change. If you want to remove the stain to match a lighter decor scheme, you need to remove the finish first. You have several options for removing the stain, from chemical furniture stain remover to sanding. The type of removal method depends on the type of finish and your personal preferences. If the stained wood has a finish, it's either shellac, lacquer or some kind of varnish. Often, the easiest way to remove a thin lacquer or shellac finish is to wipe it off with lacquer thinner for lacquer or denatured alcohol for shellac. You may also be able to sand it off without much trouble. Cured finishes, such as polyurethane or alkyd varnish, won't soften with a solvent, so you have to strip them with a chemical wood stripper. Apply the stripper with a paintbrush. Wait for the finish to bubble up, and then scrape it with a paint scraper. After neutralizing the wood stain remover with water, you're ready to work on the new stain. Sanding the wood with a progression of increasingly finer sandpaper grits removes most of the color left by an old stain. If you're applying a new stain, it should mask any residual color. You may have to remove as much as 1/16 inch of wood or more to get all the color out. That's much easier to do with an orbital or belt sander than by hand. After you've finished machine sanding, always sand by hand with the grain of the wood using the same grit sandpaper you were using in the machine to erase machine marks. Dye stains sink deeper into the wood grain than pigment stains and can't always be removed by sanding. Chlorine bleach can lighten most dyes. But before you start working with any bleach product, take precautions to keep yourself and your work space safe. Since bleach is caustic, you need lots of ventilation. You'll also want to protect your skin and eyes. Wear gloves, long pants, long-sleeved shirts and goggles to keep the bleach from touching your skin. Make a strong chlorine wood bleach by using calcium hypochlorite, which is used for chlorinating swimming pools. Mix a saturated solution by adding crystals to water until no more of the crystals dissolve. Chlorine bleach isn't effective for removing pigment stains, but you may have some success if you bleach these types of stains with two-part wood bleach. The two parts are hydrogen peroxide and sodium hydroxide. Two-part bleach comes as a kit that includes instructions for that specific product. Always follow the instructions exactly for safe use. To bleach out a dye stain from a piece of wood, apply the saturated chlorine bleach solution immediately after mixing it. The bleach quickly loses its effectiveness if you leave it standing. Wearing rubber gloves and a respirator, brush or wipe the bleach onto the bare wood. The color may immediately lighten, but you should leave the bleach on overnight to maximize the results. 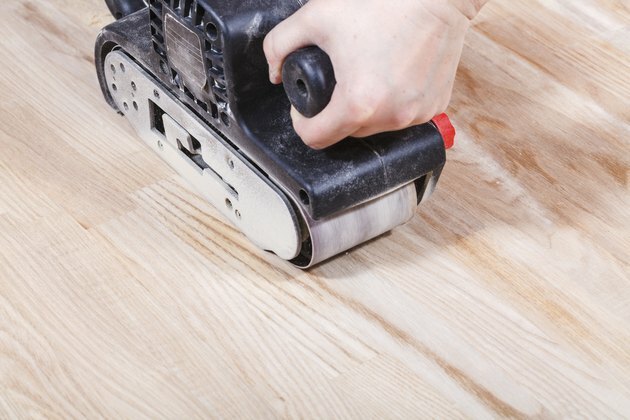 The procedure for applying two-part wood bleach depends on the product you're using, but you typically apply one component, labeled part A, and immediately follow it with part B. Some products have you mix the two parts right before using it. 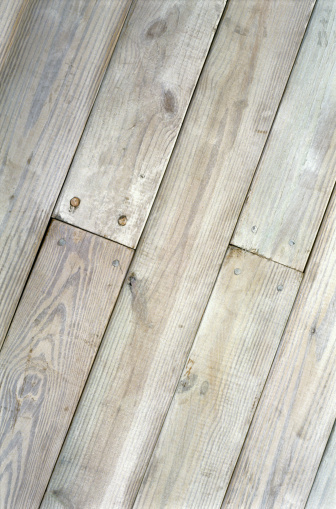 Two-part bleach lightens the natural wood color and must be used with caution. It's best to test a small area first. Removing wood stain gives you a fresh start with your cabinets, furniture or other wood pieces. Whether you use stripper, sand or bleach the wood, staying patient helps you get the results you want. How Does Bleach Affect Wood?